Thank you so much for coming to visit a dog poet. My poems, for Colleen’s weekly poetry challenge, are a take on life from a canine perspective. We poets – and to date I seem to be the only dog poet – write one of the structured poems permitted and have to integrate, as synonyms, the two words given as a prompt. This week however, being the first week in the month, we can choose our own words and mine are April and Fool. You can find out all about the challenge, the different poetry forms, and have a go yourself, by clicking below. After the dark days of winter, spring has enlivened me and I’m up for anything. 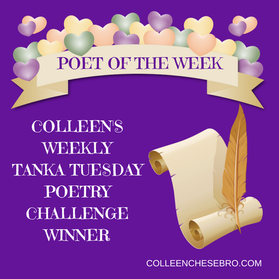 My newfound mischievousness has inspired this weeks poem, a Tanka. You can see what all the other poets got up to by clicking below. Woke up to a similar plight myself once.. Excellent writing and even more fun!